Wheelchair Statistics: How Many Wheelchair Users Are There? How many wheelchair users are there? It would seem an easy question to answer, but statistics concerning the number of wheelchair users in the world are poor. We have put together an overview of articles and statistics to estimate the number of wheelchair users in the developed world and we will use that to make an estimate of the number of wheelchair users worldwide. 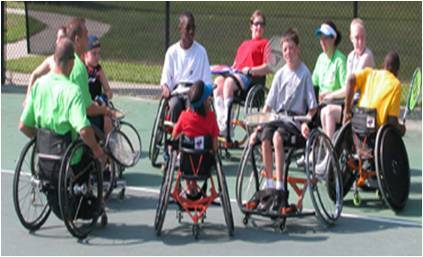 Number of Wheelchair Users In The USA: The US census estimates that in 2002 in the USA there were 2.7 million wheelchair users 15 years and older and 121,000 wheelchair users under 15 years of age (based on their estimate of 0.2% of 60.6 million children under 15 years of age.). This is a total of over 2.8 million U.S. wheelchair users. From a population of 300 million this is just under 1%. An article by Kaye et al in 2000 which also uses US census data puts the number much lower at 1.6 million Americans or 0.6% of the population and only 0.1% under 18 years of age, nearly half the amount reported by the US Census Bureau. However, a communication with Dr. Kaye clarified this. Dr Kaye wrote "The data we used for the 2000 report came from the mid-1990s, and usage of wheelchairs has skyrocketed since then. The most recent figure available from a national survey comes from 2005 data from the Survey of Income and Program Participation, and it is 3.4 million wheelchair/scooter users among the U.S. non-institutional population ages 6+, which represents 1.3% of the U.S. population ages 6 and over." Number of Wheelchair Users In Europe: Estimates of the number of wheelchair users in Europe are similar to the number of wheelchair users in the USA, with some higher and others lower. For example, Aldersea estimated that there were 710,170 wheelchair users in England while the Audit Commission reported the total number of wheelchair users for the UK to be only 640,000. With England's population being around 50 million and the UK being around 61 million, this would put the percentage of wheelchair users between 1.0-1.4% However, in 2000 the NHS Purchasing and Supply Agency rehabilitation team estimated the English wheelchair user population to be 1.2 million or roughly 2% of the population. On the otherhand a French study published in 2008 by Vignier et al put the estimate of French Wheelchair users at 0.62%. Or about 361,500 wheelchair users. A Dutch Study put the number of estimated users in the Netherlands at 152,400 at 16 million or just under 1% of the population. Therefore, European data from various countries is consistent with US data of approximately 1% of the total population using wheelchairs. If one assumes a population of 500 million in the European Union and 1% of the European population being wheelchair users, this would bring the number of wheelchair users in the European Union to approximately 5 million. Number of Wheelchair Users in Developed Countries: Developed countries are the usual market for wheelchairs and wheelchair related products. Outside of the USA and Europe, major developed countries include Japan (125 million), Canada (33 million), Australia (22 million). With a population of developed countries in excess of 1 billion and an estimated 1% of the population being wheelchair users, the number of wheelchair users in developed countries would be in excess of 10 million people. Number of Wheelchair Users In The World: One can assume that the percentage of people who need wheelchairs in undeveloped countries to be much higher? Why? Landmines play a big role in causing disabilties in underdeveloped countries. In countries such as Cambodia or Afghanistan 5-10% of males between 15-44 have had amputions due to landmines. Some diseases which cause disabilities, such as cerebral palsy are 5-10 times higher in poorer countries. However, the percentage of people who require a wheelchair but actually have a wheelchair is probably much lower. There are estimates that only 5-15% of people who need wheelchairs actually have them. The world population in 2008 was 6.7 billion. If the same 1% is used to estimate the number of wheelchair users worldwide, we would come up with 67 million people. However, unfortunately, the number of people who need wheelchairs in the world is almost certainly much more than 67 million and the number who actually have wheelchairs is almost certainly much less than 67 million. This article about wheelchair statistics is COPYRIGHTED and may not be reproduced without written permission from the owners of this website.